The Failure of Risk Management takes a close look at misused and misapplied basic analysis methods and shows how some of the most popular "risk management" methods are no better than astrology! 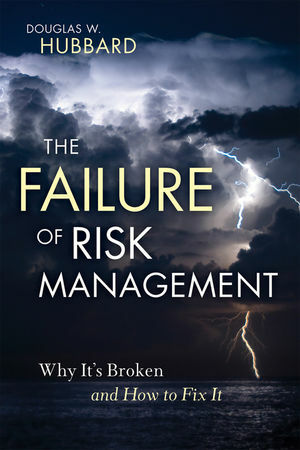 Using examples from the 2008 credit crisis, natural disasters, outsourcing to China, engineering disasters, and more, Hubbard reveals critical flaws in risk management methods–and shows how all of these problems can be fixed. The solutions involve combinations of scientifically proven and frequently used methods from nuclear power, exploratory oil, and other areas of business and government. Finally, Hubbard explains how new forms of collaboration across all industries and government can improve risk management in every field. Douglas W. Hubbard (Glen Ellyn, IL) is the inventor of Applied Information Economics (AIE) and the author of Wiley's How to Measure Anything: Finding the Value of Intangibles in Business (978-0-470-11012-6), the #1 bestseller in business math on Amazon. He has applied innovative risk assessment and risk management methods in government and corporations since 1994. "Doug Hubbard, a recognized expert among experts in the field of risk management, covers the entire spectrum of risk management in this invaluable guide. There are specific value-added take aways in each chapter that are sure to enrich all readers including IT, business management, students, and academics alike"
"In his trademark style, Doug asks the tough questions on risk management. A must-read not only for analysts, but also for the executive who is making critical business decisions." —Jim Franklin, VP Enterprise Performance Management and General Manager, Crystal Ball Global Business Unit, Oracle Corporation. Douglas W. Hubbard is the inventor of Applied Information Economics (AIE). He is an internationally recognized expert in the field of measuring intangibles, risks, and value, especially in IT value, and is a popular speaker at numerous conferences. He has written articles for InformationWeek, CIO Enterprise, and DBMS magazine. His AIE method has been applied to dozens of large Fortune 500 IT investments, military logistics, venture capital, aerospace, and environmental issues. Doug is the author of How to Measure Anything: Finding the Value of Intangibles in Business (Wiley).